I was a resident of Brighton for more than 35 years, though I now reside in Northern Thailand. I took this photograph in 1988 and it was subsequently used for the front page of a book on the centenary of Palace Pier. 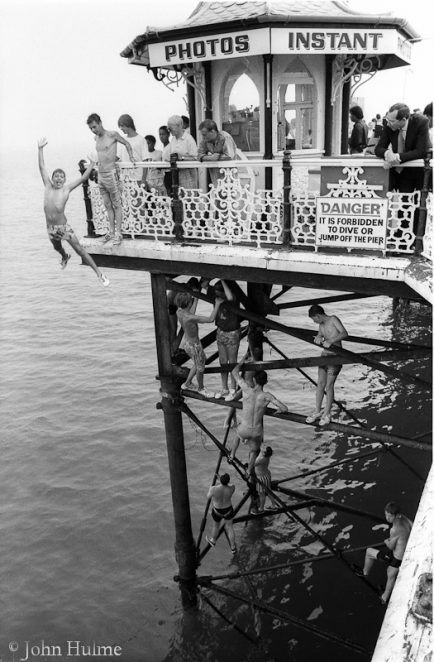 I wonder if anyone recognises the young boy diving off the pier, or indeed anyone else in the photograph? Do you have memories of the Palace Pier at this time? If you do, please leave a comment below. To view a large version in a new page, please click on the photo and then click on it again.